Having discussed at length the problems of a universal CMS implementation, I would be remiss if I didn't offer some sort of solution to the dilemma that composition instructors face. So, in this section I'll go over in brief the potential of open source solutions and the role they can play, including a brief showcase of my own work on the subject in my current writing program. Though they seem inevitable and unavoidable, it is important to remember that a CMS is an institutional choice. And, like institutions, a CMS is not unassailable. To borrow from Porter, Sullivan, et al. (2000)'s description of the institution, CMSs should be seen as, "rhetorically constructed human designs (whose power is reinforced by buildings, laws, traditions, and knowledge-making practices)" (p. 611). Just like an institution, a CMS doesn't have to be taken at face value. In the spirit of Porter, Sullivan, et al., while the institution and developers may have made them, we can fix them. In our processing of fixing the CMS problem, there are many free and open source starting points that exist for implementing our own CMS solutions for courses, giving us an important avenue to help shape our institutions. Whereas the university-default CMS may present an environment for writing that is at best stifling, with a little bit of work and development we in composition studies can put forward our own vision of what a CMS should look like in the writing classroom, giving us an important avenue to critique and amend the policies of our given institutions. The idea of an open source solution to a composition studies problem is not a new one. Open source technology has been discussed in the field for over a decade (Ratliff 2011). In fact, the Conference on College Composition and Communication went so far as to issue a resolution on open source technologies, citing the ability of such technology to control costs, allow for customization for specific programs, and to help build inter-institutional collaboration (2008). After a little bit of a learning curve, open source CMS solutions can be customized for the writing classroom, opening up an exciting new space for research and development in the composition studies. With that said, I'd like to devote the rest of this section to demonstrating some of the success I've had in developing and implementing an open source solution of my own. For the past year, I've had the privilege to in charge of the Drupal-based CMS solution used by Purdue University's Professional Writing program. After taking inventory of where the CMS was, getting feedback from existing users of the system, and also taking into account my own experiences with the course sites, I set out to create from the base CMS a course site solution that worked to compliment rather than conflict with the pedagogy I was trying to bring to my classroom. While my solution, currently titled Open Professional Writing, is far from perfect (as I and many others who use it will tell you), I believe it is a solid example of where we can begin to go as a discipline if we set our sights on building our own solution to the CMS dilemma. One of the criticism of many CMS solutions is that they are inelegant, and often appear to have been purposefully designed to hinder everyday use. For example: after using a basic Drupal solution for a year or so, I came to realize the level of frustration a single go-to menu can create when attempting to quickly and effectively run a class through a CMS. To combat this, I turned to the work of Donald A. Norman and his recent writings on complexity. In a nutshell, Norman argues that while they are often confused, there is a fundamental difference between a complex interface and a complicated one. An interface can be complex without coming across as complicated to users (Norman 2011). With this in mind, I turned to the community-authored base theme Fusion as a platform to build a visual interface that expanded the number of menus available for tasks, creating a more complex, but less complicated user interface. You can see the result from the student's point of view in Figure 1. Making use of images associated with the menu's function, as well as simple naming conventions, users are able to visualize the location of the site they are looking for without having to read through item after item in a single-stop menu. While not a perfect solution, I think the overall interface of the site demonstrates what is possible with a bit of work. Also, for those who are skeptical of their own potential to do such work, its worth nothing that I learned CSS from scratch as I pieced together the site's interface, something that is made painfully obvious by the meager styling given to the web text you are reading. One of the biggest complaints that can be mounted against a one-stop CMS solution, or really any poorly implemented CMS, is that the rhetorical system behind the CMS can run counter to and even resist the writing pedagogy that we try to teach. The basic Drupal CMS is not exempt from this, relying on blogs as the main vehicle for user composition. My goal with my own CMS solution was to present students with a CMS that allowed them to create content in a way closer to what we actually teaching about drafting, revision, etc, rather than just posting content once and being done with submission, and to do so using the metaphors that we use in the composition classroom. Making use of a few Drupal modules (Workflow, CCK, and Views primarily), I was able to piece together a Drafting system (seen in Figure 2) that comes a lot closer to our drafting pedagogy than the average CMS interface. When a student goes to create a draft, they are presented with a standard WYSIWYG text editor for drafting. Where the extra modules come into play is in how students classify what they create. Using the Draft Status selector (see Figure 3), students are able to decide where in the writing process a specific piece currently is. Students that choose to set their status to Drafting are allowed to continue work on their piece in private without worrying about other students viewing it before its done. Drafts in that position are also unable to be graded, putting into the technology the pedagogical understanding that once a draft is complete it may not be ready for submission. If a draft is set as Review Requested, the site actually moves the post to a list of documents for review, allowing other students to check out the text (much like a library checks out books) for peer revision. Finally, if a student chooses to set their draft to Draft Complete, it will be visible only to the instructor and the student (public submissions are available too), and shows up for grading by the instructor. In effect, the Draft Status selector allows students to move a document through the same writing process that we often teach to our composition students, putting the technology and pedagogy of our classrooms a bit closer in sync. As an added bonus, the Drafting system also has one other tool for students as they navigate between different drafting states. Making use of the Revision Log (see Figure 4), students are able to save multiple drafts of a document and move between those drafts as they prepare the text for submission. A base feature of Drupal, the Revision log can be turned on for posts and allows students to make a comment describing what their current draft represents as far as work, changes, and ideas. Every time the document is saved again, a new revision is saved, complete with a new note on the revision's state. Once a student has gone through multiple revisions, they can choose to revert to any other saved revision with a few clicks. Combined with the Draft Status selector, the Revision log allows an even closer approximation in the CMS space of what we teach students in the classroom. As one of the most critical users of the Open Professional Writing course site build, I am the first to admit what I've put together isn't a perfect marriage of pedagogy and technology, and it certainly doesn't represent a perfect replacement for the universal CMS that many of us have come to battle on a regular basis. My CMS is at its heart a specific response to the needs of a specific program and its instructors. More than anything, I believe that what it represents is a glimpse into where we can go when we take our current expertise in writing in digital environments and make use of it to offer a solution to our CMS problems. 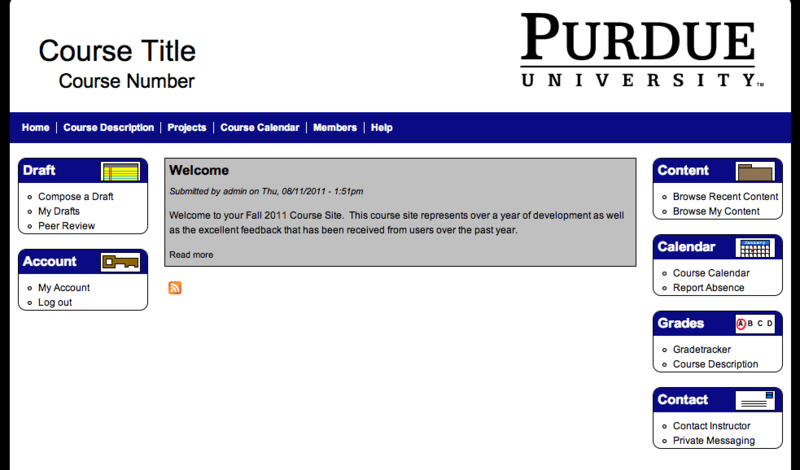 The work I've shown isthe product of a single self-taught graduate student's work with an open source CMS over a year. Just imagine what we can do as more and more of us bring our considerable talents in digital composition to the CMS space.